It must be just after SHOT show because we have yet ANOTHER new gun hitting the marketplace. This time an updated TPR from Bersa. 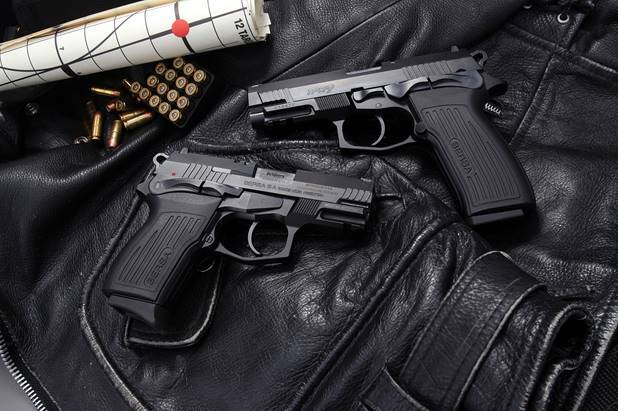 Let's take a look at the improvements Bersa has made with these pistols. A thinner grip, which allows for better reach to the new-and-improved trigger during single and double action. Serrations in the front part of the frame for firm thumb support and to reduce the muzzle flip. Ambidextrous safety, slide and magazine releases. Compact, lightweight and snag-free slide profile – featuring serrations in the front part of the slide for easy racking. A loaded chamber indicator protrudes from the upper face of the slide, to show the condition of the pistol without breaking the grip. An improved Browning-Petter locking system. Lifetime service contract for original owners. And those are just the highlighted features of the new TPR series. For an even more in-depth look at all of Bersa's TPR series click here to be redirected to Bersa's site directly. And if any of that sounds interesting enough for you to consider buying one, Bersa has announced along with this reveal that they are already shipping in the United States, so you can pick one up now if you are so inclined. The MSRP currently has them going for between $508 and $528 depending on the caliber you choose. Caliber options include 9 mm (TPR9) and compact, 9mm (TPR9C), .40 S&W (TPR40C) and .45 ACP (TPR45C). So what do you think? Does the updated TPR series look good to you or is it gonna be a pass in your mind? Let us know your thoughts in the comments below.